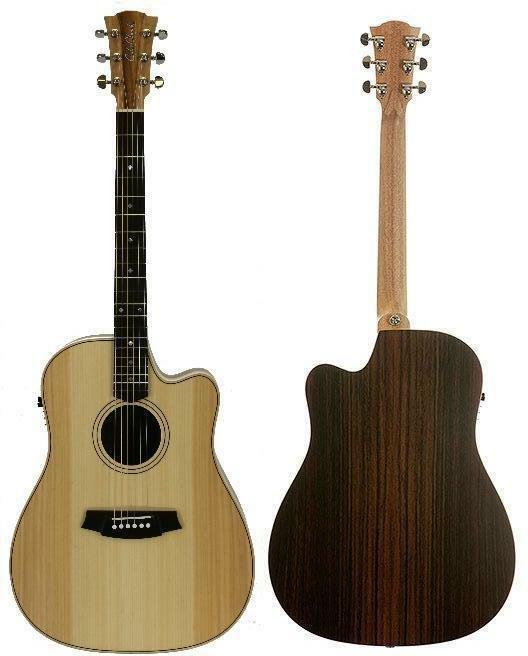 The Cole Clark Fat Lady 2EC in Bunya Rosewood is a popular high-end model in the 2 series of Cole Clarks here at Haworth Music. The solid bunya top and solid Indian rosewood back and sides combine to give this Cole Clark FL2EC a big bright sound when played acoustically. The cutaway makes it easy to get to the higher frets and the 3 way pickup system on this Cole Clark really sounds incredible when the guitar is amplified. Aesthetically the darker look of the rosewood gives this FL2EC a somewhat classy look when compared to lighter timbers such as maple as does the rosewood fretboard. The Cole Clark Fat Lady 2EC in Bunya Rosewood is a real hit here at Haworth Guitars as a high end acoustic guitar which sounds amazing and feels great to play too!